As I’ve mentioned in my previous posts on Angrboda in the Deity and the Divine series, one of the symbols that has been the primary focus of my iconography for Her has been the heart – primarily an anatomically correct human heart. The heart is also the primary connection between a variety of stories in the Northern Tradition. Both the story of Gullveig and the story of Angrboda’s Children tell how each Goddess was speared and burned three times. The first war was instigated when the Van-allied Gullveig was speared and burned upon her visit to Odin (Har)’s Hall in Asgard.She was reborn as the volva Heith, much beloved by ‘evil’ women/witches/troll women. And thence among men | came the monsters all. 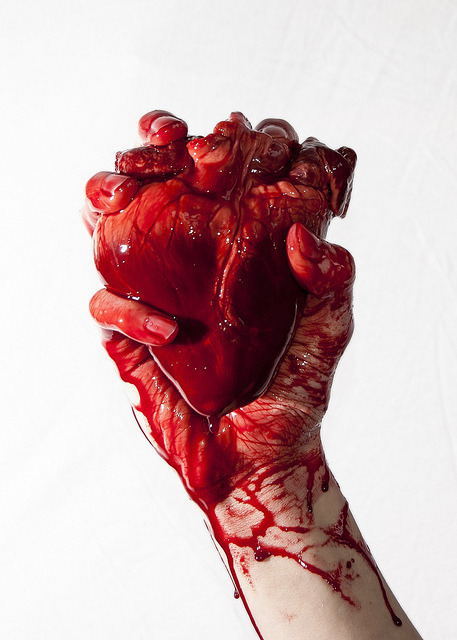 After having consumed this heart, Loki then gave birth to monsters and witches – because of this the connection is made between the heart and Gullveig. In Thursatru tradition, the Heart of Gullveig is held to be the seed of chaos; black, rime-cold, glacier made from the primordial black ice. The Cosmic Fire of the Aesir could not burn a heart so cold, and merely half singed it. This heart is Her ultimate Thursian essence. In the story of Angrboda’s Children, as told by Her to Raven Kaldera, Angrboda is lured out of the Ironwood by Odin, and comes to Him in Asgard. “My business with you does indeed involve Loki,” Odin said. “Give me a moment, and I will have this business brought to you, that you might advise me on it.” And he stood, ready to leave the hall, and yet before he left he hesitated. He looked upon the tall, proud giantess in her cloak of furs, and he bowed before her respectfully, and Angrboda saw a sorrow in his demeanor. Then he left the hall, and she sat with furrowed brow, waiting. He had been gone but a moment when she realized that with Odin’s departure, all others in the hall had also gone, and she was alone. Sensing danger, she started to her feet and drew her blade – she had wondered why Odin had not insisted that she give up her sword – but there was no one to fight. Then, in a split second, the entire hall burst into flames. Fire ran down the tables as if oil had been poured over them, and the roof was an inferno in moments. Angrboda’s long red hair was the first to catch, and she went up like a torch, screaming curses. “For Loki had arrived at night, while Odin was looting his wife’s house, and some took joy in telling him of the death of the Hag of the Iron Wood. He rushed to the hall, which was still roaring in flames, but he had not learned nothing from his foster-father Surt the Black. Leaping through the flames unharmed, he found Angrboda’s burned body, which crumbled at his touch. All that was left was her ashen heart, still solid, so he placed it next to his and fled Asgard as fast as he could. When he reached her hall, he found it plundered and burned, and her kinsmen dead, and his children gone. He screamed and raged, and the folk of the Iron Wood arose, and they all wept and raged with him. They would have marched on Asgard as they were, armed only with their fury and rude weapons, but Loki recovered himself enough to stop them. “There has been enough death for one night,” he said. “Now it is time to undo at least one of them.” And he placed Angrboda’s ashen heart on the hearth of the burned hall, and took a knife and let blood onto it from his arm, and every one of her kinsmen in the Wolf tribe came forward also and let their blood drip, so that the hearth ran with blood. As the sun rose and the word spread, Jotnar from the other tribes came as well, and may of them shed their blood for her life also, as Loki danced about the hearth and the Wolf tribe howled a strange song. Clearly, these stories are different, but they also strongly echo the same themes, particularly that of renewed life from the remains of a heart. It is my personal feeling that both of these stories are correct, and that Gullveig-Angrboda was burned and renewed at two separate occasions; at the dawn of the world, She was allied with the Van, and using the name Gullveig visited the Aesir, and Her poor treatment as Their ally sparked the First War. Gullveig-Angrboda’s rebirth is another indication of Her connection to the Van. The Vanir are fertility and agricultural Powers, part of the Life-Death-Rebirth cycle; some hold the UPG that the Van’s strength in battle during the First War was the magic of Freya, bringing the fallen Van warriors back, so they could arise from death and fight again. Ultimately the First War ended in a standstill, and a peace was negotiated between the two tribes, and hostages exchanged. One more historical saga has a tale about hearts has ties to Angrboda; the Volsung Saga has the story of Sigurd slaying the dragon Fafnir. (see my previous posts above which further explain how I came to connect Angrboda with the Volsungs) After having slain the dragon, Regin asked Sigurd to give him Fafnir’s heart to eat. Sigurd had consumed some of the dragon’s blood, and thus learned the language of the birds, who told him how Regin was planning to betray him and advise him to kill Regin first. . Sigurd beheads Regin, roasts Fafnir’s heart and consumes part of it. This gives him the gift of “wisdom” (prophecy). As previously discussed, Angrboda is a volva and a seeress, connected both to the Volsung line via the maternal line, and with hearts through her own mysteries. Outside of ‘the lore’ my own experience, my own personal practice (both magical/spiritual/personal) and my UPG related to Angrboda/Gullveig have heavily featured hearts. 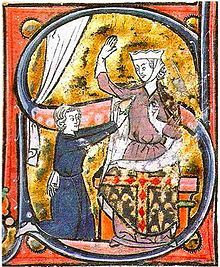 The first known depiction of a heart as a symbol of romantic love dates to the 1250s. It occurs in a miniature decorating a capital S in a manuscript of the French Roman de la poire (National Library FR MS. 2086, plate 12). In the miniature, a kneeling lover (or more precisely, an allegory of the lover’s “sweet gaze” or douz regart) offers his heart to a damsel. In this case, they are specifically discussing the <3, the stylized heart symbol. She-who-brings-sorrow is also full of love. She is a Divine Mother, giving birth to Gods, and She loves Her children. She loves Loki, her consort. She loves her tribe. She loves those who are Hers. She loves fiercely, She loves honestly. If She loves you, She loves all of you, even the ugly, monstrous bits. Her body is speared and burnt, but Her loving Heart always survives, allowing her to be brought back. She gave birth to Gods, and to Herself, from Herself. When Loki consumes Gullveig’s heart, and it causes him to become pregnant and birth witches and troll women. When She was burnt again, Angrboda’s heart remained and Love called her back; Her love for Her Children, torn from her, the love of Her people, who’s blood powered Loki’s magic. During the evening the tables were set; and now I must tell you what food was made ready for the spae-queen. There was prepared for her porridge of kid’s milk, and hearts of all kinds of living creatures there found were cooked for her. She had a brazen spoon, and a knife with a handle of walrus-tusk, which was mounted with two rings of brass, and the point of it was broken off. One of my personal kennings for Angrboda is Heart of Jarnvidr (this is also the name of my devotional blog located on tumblr) As the Chief of Chiefs of the Ironwood Clans, Angrboda their war leader, and as Chieftess acts as Gythia to Her people. As the Hagia of the Ironwood, She is their Wisewoman. And when She was dead, the Ironwood came together over Her heart, to bring back The Heart of the Ironwood.